JP Duminy will miss South Africa's tour of Australia in November as he requires shoulder surgery. The all-rounder will not be available for the limited-overs games, with the Proteas playing three one-dayers and a solitary Twenty20 fixture on the trip, having aggravated a right shoulder injury against Zimbabwe. 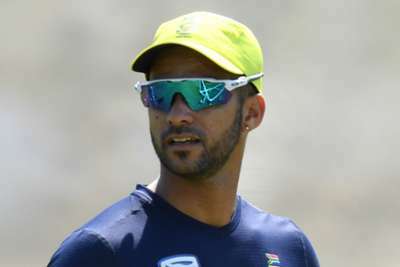 South Africa have not yet put a date on a return for Duminy, who has stood in for the absent Faf du Plessis as captain on occasions this year. "JP aggravated a pre-existing shoulder injury during the recently concluded series against Zimbabwe," said team manager Dr Mohammed Moosajee. "The injury will require surgical management thus ruling him out of the immediate tour of Australia and the upcoming MSL [Mzansi Super League]. At the moment, we can't say how long he will be out for. That is dependent on the results from the surgery." South Africa coach Ottis Gibson had already confirmed Hashim Amla will also not travel to Australia as he nurses a finger injury. Duminy, like Amla, had been named as a marquee Proteas player for the upcoming Mzansi Super League. He will be replaced by Quinton de Kock for the Cape Town Blitz.